Most of you have been writing about the secular nature of churches in England, how they don’t really seem like a spiritual community, and how it is a bit disturbing that all of them come with cafes and gift shops. While I agree with these thoughts, I don’t think that it is necessarily all bad, and I think that we need to consider that we are not seeing the entire picture. I think that the secularism of the Anglican Church particularly stands out against our visits to the Mandir and the mosque. 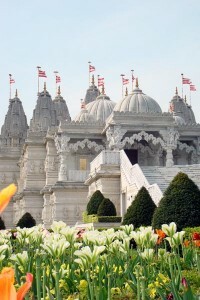 At these places of worship, people go to pray every day and there are spiritual ceremonies every day as well. They each have schools, child care centers, and service projects that reach out to the community. I can see where we might wonder why we are not seeing the Anglican Church step up to its role as a spiritual and community leader, but remember that we discussed in our first ever class meeting how in these minority communities, religion is very much one and the same with culture, especially in Islam. The difficulties they have assimilating into English culture are due in large part to religion. Religious teachings and traditions have become well ingrained cultural traditions. Anglicanism is a relatively new religion in comparison with Hindu and Islam, and does not play the role of being one and the same with culture like it does in the other communities. And when you are the majority community racially, religiously, politically etc…it doesn’t need to be. The second point I wanted to make in this post is that Westminster Abbey and St. Paul’s do remember their function as places of worship. 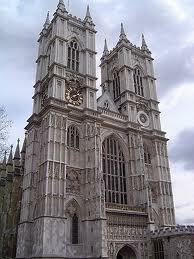 I was on the Westminster Abbey tour with the science group. We were there at noon, and at that time an announcement came on that called for a moment of silence. John reminded us that we were in a church, not a museum, and I noticed that nearly everyone visiting the Abbey at that time, tourists included, was respectful of this moment. 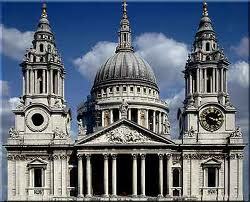 I also attended Evensong at St. Paul’s and thought that it was a beautiful and moving experience. I think that they balance their two roles as best as they can, and hey, if my church had a café, I would use it. Speaking of places of worship that balance spirituality and tourism, look at Vatican City. No one can argue that this is not a deeply meaningful and spiritual place; Catholics journey from miles around to hear the Pope speak on Christmas, or at any other time of the year really, but it is also a huge attraction, complete with guided tours through St. Peters and rampant pick pocketing. photo credit: Google Images. All of these buildings were too big and beautiful for me to take a good picture of them myself. Finally, the fact remains that we have not been to any small Anglican parishes in specific residential neighborhoods of London. I’m sure that there are religious Anglicans in London who do go to church every Sunday and whose churches run community service projects and functions, but, similar to your local church at home, which also attracts no visitors, these churches probably don’t have history such as the Battle of Hastings and the Great Fire of London surrounding them. We definitely are not seeing the whole picture here, which is why I cannot join in lamenting and expressing disappointment in places like Westminster Abbey or St. Paul’s, or the Anglican Church in general. I’ll admit that I have not been to a wide variety of pubs, so I’ll have to do my best to draw conclusions from the experience I do have. I have genuinely enjoyed the ones I have been to, we’ve just been so darn busy here and I’m always so tired that I don’t go out very often. I disagree with some of my classmates who have been arguing that pubs are overpriced and that the food isn’t worth it. I actually think some of the pubs have pretty good deals. At some you can get a sandwich and chips or a sandwich and a drink for under four pounds, which is more than you can say for Pret or Sainsbury’s, depending on what you get there. The food might not be the best, and certainly not the healthiest, but on occasion I enjoy a bit of grease, and I especially like the part where you order and they bring you the food and you don’t have to do anything. Also there are chips (fries) which are my favorite food in the world. I’ll start by comparing pubs at lunch and pubs at dinner. I’ve found that it’s a lot easier to get into pubs at lunchtime; it’s a lot less crowded. When it isn’t crowded, I feel sure that I’m not intruding or bothering anyone. Walking into a crowded pub at dinnertime or at night can be awkward because you’re unsure if all the people there already know each other or if you’ll be taking someone’s regular table or chair. It can be a bit unwelcoming. The exception to this that I’ve found is the Court. The Court seems to cater specifically to a young, student crowd with their meal deals and discount card. Everyone seems to go there with their own group of friends and doesn’t really pay anyone else any mind. I don’t get the impression that there are “regulars” there. Students can be a bit transient. The consequences of this younger crowd, however, are extra loud American pop music, questionable wardrobes, and general drunken disorderliness. The times I’ve gone there I’ve had a good time, despite the fact that I have to shout to be heard and worry that I’m going to get beer spilled on me at any moment. I agree with George Orwell that pubs where it is quiet and you can hear yourself talk are preferable. The Marlborough Arms has this advantage over the Court. The music is softer and there is less drunkenness. I feel generally welcome there too, although the crowd is a bit older and I do get the feeling that there are regulars, most of whom are British. I think the regular thing contributes to the different level of classiness, though. However, I also agree with Orwell that you can’t win on all counts – the food at the Marlborough Arms is more expensive. I think as a group we are beginning to get the hang of the buying drinks in rounds thing, and some people remember to ask to buy the bartender a drink, although they usually refuse. Still, I’m not sure that we will ever fully be able to pass for being English in a pub, and I think that although we have knowledge of the general pub rules, each individual pub has its own hidden rules and traditions. I’m hoping that perhaps this will get easier when we go out with our roommates at UEA who are actually British. Oh right, the city. There it is. These two pictures seem a bit incongruous; you could probably lie, and tell people that they are different lakes in different places, and they might believe you. or just being alone and doing whatever you want. A last really important use for parks, I think, is creating a safe space for children. Professor Qualls brought up this point on the Bloomsbury walking tour, when he took us past the Coram playground, and explained that it was fenced off because you were not allowed in unless you had a child. 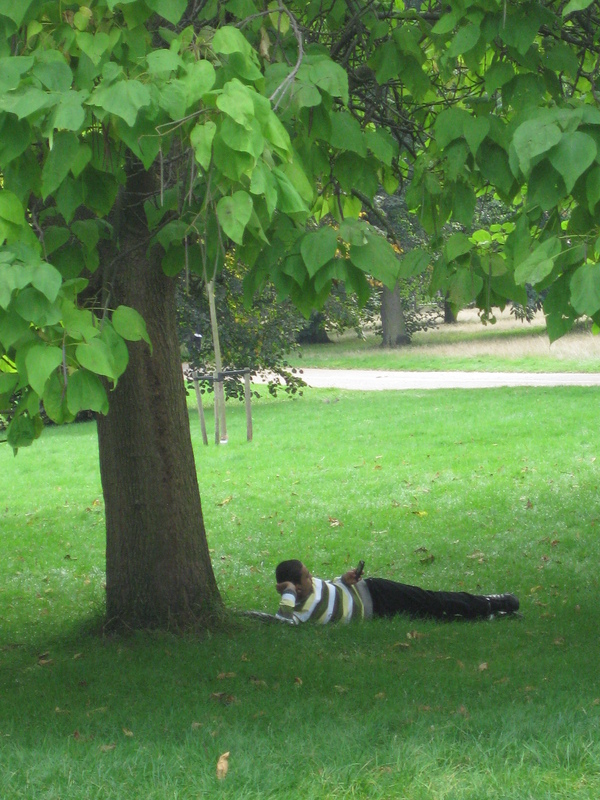 I saw this again at the Princess Diana Memorial Playground in Hyde Park. It was fenced, plus there was a guard at the door checking people. I witnessed a man come up to the guard and ask if he could see if his wife was in there with his son. The guard told him he could not go in. While this man probably was the father of a child, it is also possible that he could have been a child snatcher, and I personally am a fan of this playground rule that protects children against them. I don’t think we have this in America, or at least I’ve never seen it. At the playground near my house, high school kids smoke pot after school. While I am excited to move to Norwich and escape the city more or less permanently, when I do return to London, parks will be on my list of places to revisit. 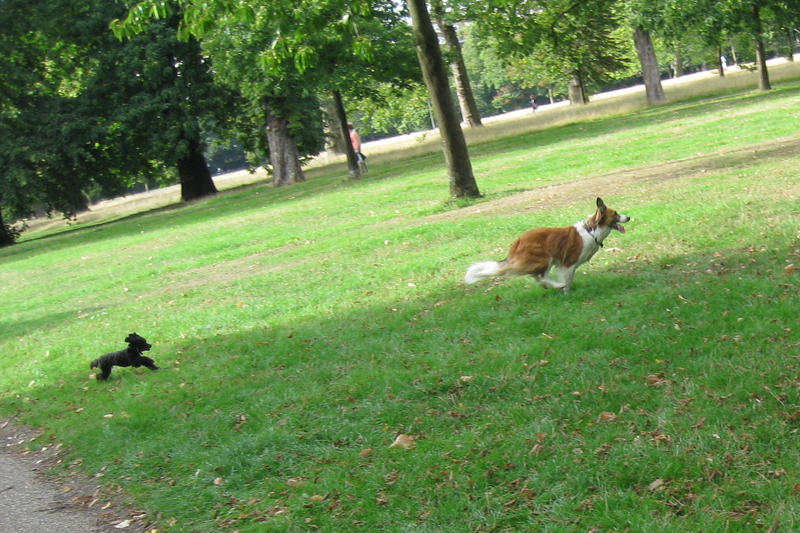 *Note: I am not exactly sure where Kensington Gardens ends and Hyde Park begins. 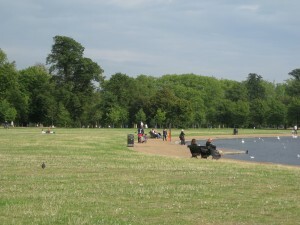 This lake could very well technically be in Kensington Gardens. 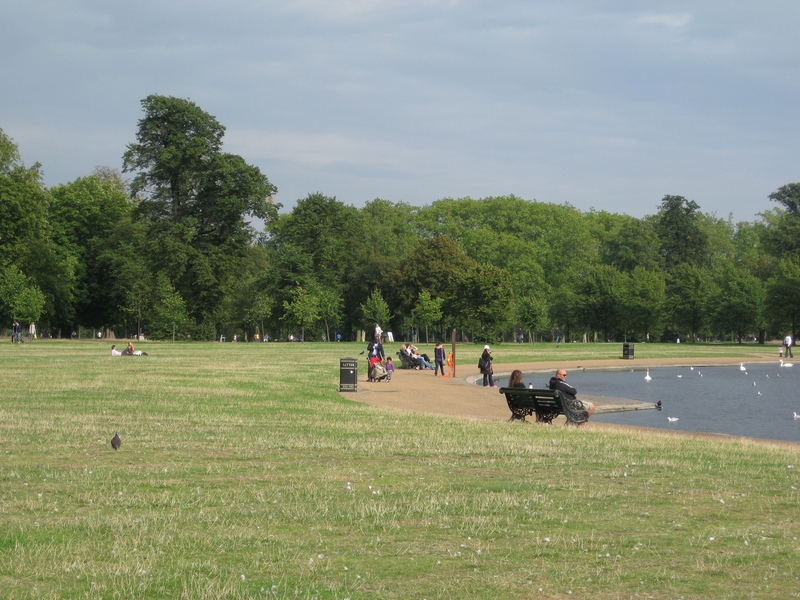 My apologies to Kensington Gardens if this is the case. **Note also: all photos in this post are mine. Sorry if you think I’m creepy for taking pictures of random people. It was all in the spirit of academia. I have now seen a total of five shows here in London. First, the Merry Wives of Windsor at the Globe Theatre, followed by the Czech Philharmonic concert at Royal Albert Hall, Les Miserables at the Queen’s Theatre, The 39 Steps at the Criterion Theatre, and The Habit of Art at the National Theatre. For this blog post, I will focus on The 39 Steps and The Habit of Art, because I think these shows have certain things in common that are a good demonstration of British culture. Both shows were distinctly meta-theatrical. In The 39 Steps, costume and set changes happened right on stage and Professor Jordan proclaims the show’s self-consciousness when he is shot by a bodiless arm at the end of the show and shouts “This is supposed to be a four person cast!” The Habit of Art is a play within a play. Better yet, the play within the play is being rehearsed at the National Theatre, where the play is being shown. The rehearsal of Caliban’s Day is frequently interrupted by the actors, the stage manager, and the writer to talk about the trials and tribulations of acting, writing, and theatre. I think that both of these shows’ use of meta-theatre demonstrates the British love of irony and humor, their tendency toward self-consciousness and self-deprecation, and the Importance of Not Being Earnest Rule as defined by Kate Fox. Meta-theatre demonstrates that the show and the playwright are not taking themselves too seriously. When some of the class was talking during intermission, I remember Matt wondering why there couldn’t have just been a play about Auden and Britton, and why they had to go to the trouble of adding all the extra characters and putting it in a frame. He suggested that the playwright was too worried that a serious play about Auden and Britton would not go over well. This theory may be exactly right. 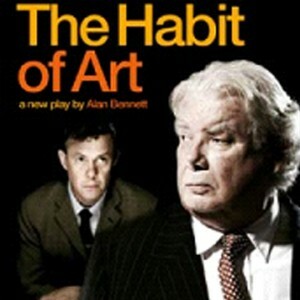 A play just about Auden and Britton may have been reviewed with an “Oh come off it” rather than a “deeply and unexpectedly moving” and a “I can think of few plays that combine wild laughter, deep emotion, and technical ingenuity with such bravura” (Charles Spencer, Telegraph, 18 November 2009). This is still just a theory. As a sidenote, I do think the framing had its merits. Caliban’s Day is about the pressure to create art, the artist’s consciousness of his role and reputation as an artist, and the contriving that goes on behind the scenes with the artist’s fear of biographical information seeping into or being read into his art. The insecure actors and writer and the ever-comforting and conciliatory stage manager are a parallel story to Auden’s and Britton’s, allowing the themes to be developed more deeply and thoroughly, applying them to theatre as well as poetry and music. We have talked about theatre in London as being a sort of equalizer. Anyone who can afford even fifteen pounds can get a pretty good seat for a show. 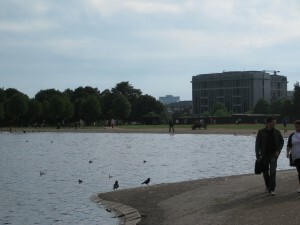 In the National Theatre, there are no restricted view seats nor are there any boxes. Everyone is on the same footing, and to demonstrate this, we got to sit in the same row as Sir Ian McKellen at The Habit of Art. While all of this is true, I still felt like a bit of an outsider at both of these shows. 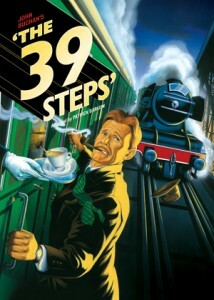 I really enjoyed The 39 Steps, but I still had some trouble catching all of the jokes, even after having read Fox and lived in London for a month. 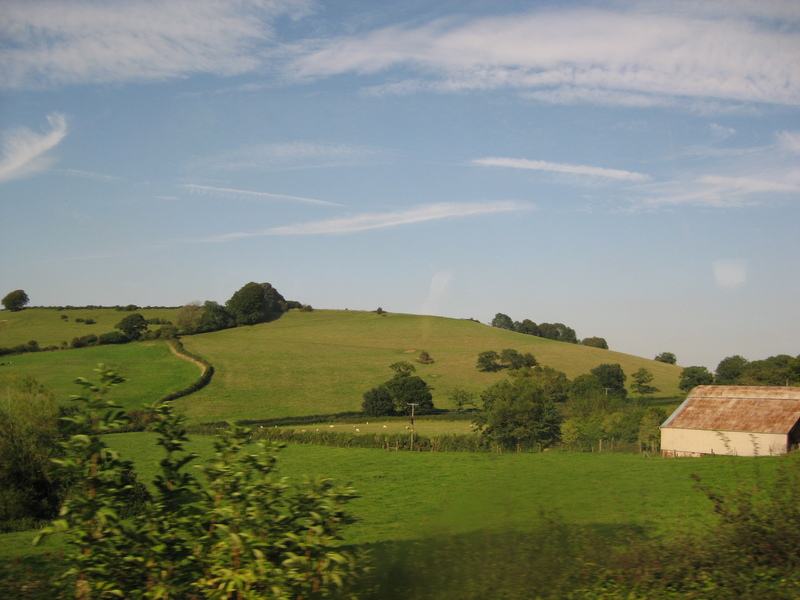 Many of the jokes, such as the jokes about Welsh politics and the “sorry, sorry, sorry” sequence on the train are distinctly British, and not fully accessible to us foreigners. The same held true with the humor in The Habit of Art. I’m not complaining; I’m sure American movies and plays present the same problems to the British. I do think I have a point though, in saying that the content in The Habit of Art was not accessible to just anyone. I think in order to fully understand the play, you needed a reasonable understanding of theatre and its operations (in this respect our backstage tour helped a lot) and an understanding of Auden’s biography, his poetry and The Tempest. It took me probably until close to intermission to grasp who all the characters were and the plotlines of both stories. I think the play was rather intellectual, despite containing much crude humor, and perhaps did not quite match the humble and universally accessible National Theatre. I think that some of my favorite activities we’ve done since we’ve been here have been our day trips to Bath, Oxford, and Stratford. I don’t think I could ever live in a city permanently; the crowds, the chaos, the push and shove hustle and bustle in London would definitely be too stressful for me to handle on a long term basis. Driving through the countryside on our way to our destinations was a refreshing break for me, and was much more reminiscent of home than our lives in the city. Below is a picture I took through the bus window on our way home from Bath. There are several key differences I have observed between London and the smaller cities of Bath, Oxford, and Stratford. Let’s begin with visuals. 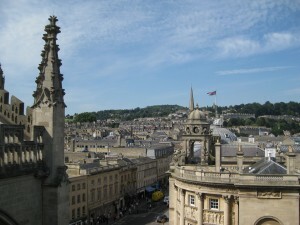 First is a picture I took from halfway up to the top of Bath Abbey looking out over Bath. 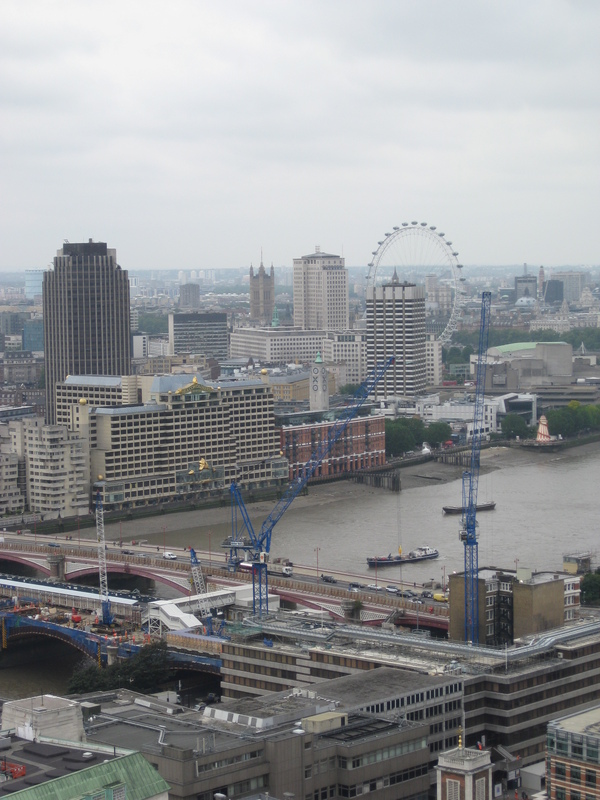 Next is a picture I took from the top of St. Paul’s Cathedral looking out over London. You can also see from the pictures that the buildings in Bath are a lot shorter than the buildings in London. In Bath, the tallest feature is a spire, like it used to be in London. 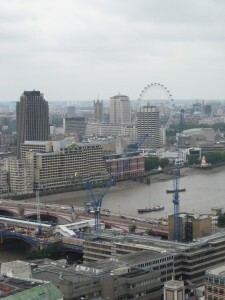 In London, the skyscrapers on the horizon, each one striving to be taller than the last, demonstrates the individualistic capitalism and commercialism that has touched this city more than others. Our day trips have reminded me how London truly is the financial and cultural capital of the world, a place which draws people, a place where things always have to be happening. Bath, Oxford and Stratford seem to be less touched by this globalized commercialism. I did spot a Ben and Jerry’s in Bath, but I did not see Starbucks and KFC’s on every corner like we do in London. I think that a slower pace of life and a greater appreciation for people goes hand in hand with the softened touch of commercialism in the smaller cities. I think a good example of this contrast is seen by comparing busking in Bath and London. From what I learned from our tour guide in the Bath Abbey, the buskers have their own kind of community. In Bath, you don’t need a license to perform in the streets, but you are only allowed to stay in the same place for one hour before you have to move 50 metres down the street. 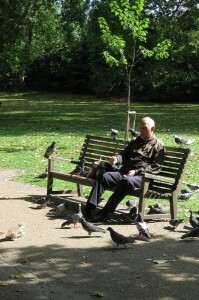 The buskers regulate this themselves; they form their own queues and rotations for different spots throughout the city. In London, buskers need a license, and they are assigned a specific spot and specific time to perform. It is doubtful that many of them know each other or even cross paths. Furthermore, in Bath, people sit around the squares and actually listen to the busker perform for the entire half hour or hour he is there. In the London Underground, people always hurry right past the performers, barely noticing them. 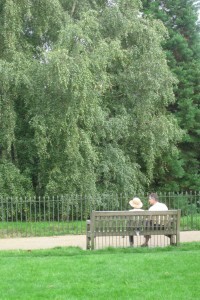 In the smaller cities, I felt like there were actually people, as opposed to the anonymous mass we have observed in London. Personally, I prefer the smaller towns and cities to London, but they are not without their disadvantages. Obviously, there is not as much diversity to be found in the smaller cites, nor are there are many opportunities for arts and museums as there are in London. A problem with the argument I have made in this post is that the three smaller cities we’ve gone to have also been very touristy cities. Although I feel as though the observations I have made are accurate, I recognize that they are limited by the presence of tourists queuing for attractions and buying gifts in gift shops. I am excited to move to Norwich, a less touristy town and one in which we will actually get to participate in the communitiy, to see if my observations hold true. On Sunday I journeyed with Sarah and Emily down to Oxford Street to replace my sorely missed Swatch. I remembered passing the Swatch store on the Number 10 bus to Royal Albert Hall. (Incidentally, Royal Albert Hall was where my watch went missing.) With part of the Central Line closed for maintenance, we decided to take the same bus again. It dropped us off right outside the Swatch store and I quickly found a new watch I really liked. I was planning to post a picture of me wearing it with this blog, but one of the links broke today when I took it off to go through the metal detector at the Hindu Temple and I currently cannot wear it. The city of London apparently does not want me to ever know what time it is. Fortunately, Swatches come with a two year warranty, and I will get it fixed as soon as I get the chance. We decided to explore some more of the shops on Oxford Street that afternoon. There were some stores that I had not heard of in the U.S. and some that I had. First, we went into Top Shop, a new store for me. They do operate in the U.S., although it is a British chain, I had just never seen one. The clothes were similar to what we would see at H&M or Forever 21, but significantly pricier. Next, we went into H&M, a store I am familiar with in the U.S., although they are based in Sweden. Although I am familiar with the store, the selection of clothing here was very different from what I am used to seeing in the U.S. The most striking difference was the lack of color. Where in the U.S. you can buy sweaters in a range of colors from bright red to royal purple, everything here seemed to come in the practical, muted colors of white, black, grey, beige, occasionally salmon or olive. It seems that this must be reflecting the English preference for modesty, privacy, and stoicism mentioned by Fox. Perhaps the English feel that wearing bright colors would draw attention to themselves in public, compromising their method of denying that they or the people surrounding them exist outside the privacy of their homes. Wearing bright colors may also indicate earnestness, trying too hard, or taking oneself too seriously. The Importance of Not Being Earnest is a cardinal rule, according to Fox. I reviewed Fox’s chapter on dress codes, but I did not find it very helpful for understanding this; she mostly talks about street sub-cultures and determining class from dress. She does say that the English have little style sense plus a lot of anxiety about dressing appropriately. Perhaps they just sell muted colors to make it easier on themselves. Another store we ventured into was Primark. This store was not mentioned in Fox, but it seemed to us like it was the English equivalent of a Wal-Mart, with tables of plain t-shirts and sweaters for 3 or 5 pounds apiece and five pairs of fake pearl earrings for a pound. The scene in there though, did not allow us much space or time to think about class. People were dragging around huge mesh Primark bags and just piling clothes and towels into them, taking handfuls of jewelry and socks. It was unlike any scene I have ever seen in Wal-Marts in the U.S. It was insane. There were 10-12 cash registers in each department, with the queues winding their way through the whole departments. Let’s just say that if I ever go back to Oxford Street, it will not be on a Sunday, but a weekday at, say, 10 am. Reflecting though, it seems that Primark might be the type of store that English lower classes shop out of necessity, upper classes shop in so they can show off their “great deals” and that the middle classes wouldn’t be caught dead in. We felt just a little bit guilty at first going shopping on Oxford Street instead of visiting a museum or a park, but it turned out to be quite a London learning experience, and definitely something to blog about. The National Portrait Gallery: A Different Perspective? First, the National Portrait Gallery is primarily an art museum, and secondarily a history museum. Much of the text on the signs focused on the artist, the painting techniques, and the treatment of the painting to preserve it. This type of text was accompanied by a short biography of the subject of the painting. The museum is not necessarily obligated to present a comprehensive picture of the history of immigration or the changing makeup of London neighborhoods and the other topics we have focused on so far. I think it falls into an entirely different category from other museums such as the Museum of London and the British Museum. Even so, I would argue that the NPG does teach us something about British culture and history precisely because of the lack of portraits of non-white lower class people. We need to remember that lower class British citizens could not afford to have portraits painted of themselves. Secondly, British citizen regarded their slaves as objects, not people, and regarded the people of the countries they imperialized as distinctly inferior to them. It would have occurred to no one to depict these people in a portrait, and the people with the money would not have paid for it. Historians and artists throughout history have only become interested in and recognized the importance these communities only in hindsight. It is the same story in the US concerning our own slaves and Native Americans. The National Portrait Gallery shows us this, and is a sort of indirectly and unfortunately accurate depiction of British history and the history of immigrant populations. It is true that unlike the Docklands Museum and the Museum of London, the National Portrait Gallery is not apologetic about the absence of minorities. I say “absence” here and not “omission” or a synonym because the lack of diversity in the portraits is more due to a lack of resources than elitism – a word that I feel implies purposefulness. However, the Docklands Museum and the Museum of London are more diverse museums in general, with pieces like pottery, tools, furniture, clothing, human remains etc… to tell their story, while the NPG’s goal is to portray history and culture specifically through portraiture. I think a particularly interesting painting in the NPG was a portrait of Elizabeth I. An X-ray of this painting showed that it had been painted on a reused canvas; painted over an unfinished portrait of an unknown woman. The unknown woman is facing in the opposite direction from Elizabeth and is painted on a completely different position on the canvas. I think what drew me to this painting was the mysterious aspect of it – almost a second painting that was hidden until revealed by modern technology. Although I was sort of weirded out by some of the more modern portraits (particularly the silicone and glass skull filled with the artists own blood) I enjoyed my visit today, and feel as though it was both useful and informative. Bathrooms/toilets/loos: In America, bathroom stall doors and walls are constructed with the least amount of material possible, with a lock that might be a hook through a loop, or a latch in a slot. People check underneath the doors to see if the stall is occupied or gently poke the door, not without the danger of disengaging the flimsy lock. In England, there are floor to ceiling doors with legitimate deadbolts. In addition, the part of the lock on the outside of the door will show red when occupied, just so no one even tries to test the door of your occupied stall. Not that you could look under the doors if you tried. I probably would not have taken this much notice of the difference between the two countries I have now “lived in” had I not been thoroughly aware of the English obsession with and need for privacy through Fox. However, I like this aspect of the English obsession with privacy. Unlike some of the other privacy related quirks, such as not asking someone’s name upon meeting them, this one actually seems adaptive. On the tube: Although the English are obsessed with privacy, they do not share American qualms about sitting next to strangers. If we were on a train in America, and the only seat open was next to a stranger, we would rather stand. 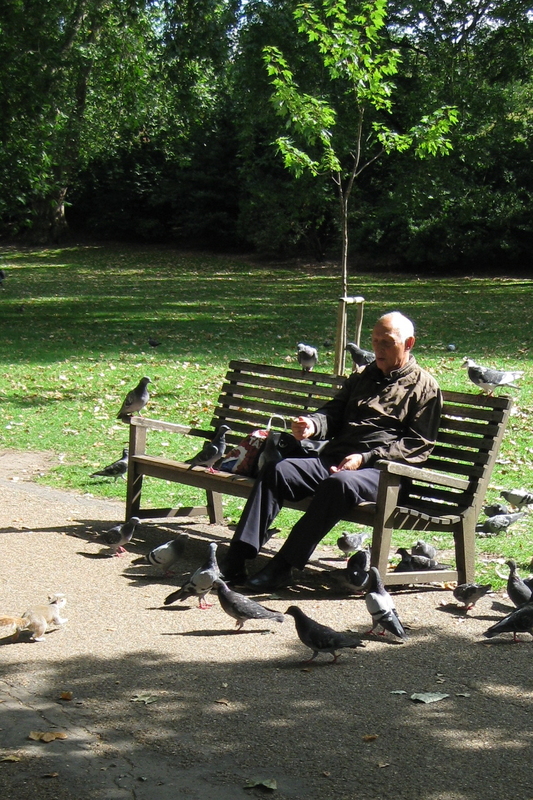 In England, people go for any available tube seat. Do they acknowledge that they have a neighbor or make any attempt to talk to them? No, but I have caught our group standing for a whole train ride unless there are seats where we can all sit next to each other. We Americans have apparently not perfected Fox’s “denial rule” of pretending that we are alone, even in public. Do not rush eating in England unless you are getting take-away: During our lunch break during class at the UEA London Centre, some of the group (perhaps foolishly, in denial about how much time we actually had) decided to go to a pub. We all ordered sandwiches. They were good, but we did not get our food until we only had like 10 minutes to eat before getting back to class. We scarfed it as fast as we could (this felt rude), some of the group took their sandwiches in napkins back to the classroom (this also felt rude), and some of us left the remainder of our lunches on our plates (this also felt rude). When people do get take away for lunch, they are always in a hurry. You can see people power walking through the tube stations with briefcases and sandwiches from Pret a Manger. Clearly the English have specific rules for the settings and circumstances in which you can hurry and not hurry your eating, and we are learning the rules as we go. At most take away places, it even costs less to take away then to eat in. I wasn’t quite sure how to interact with the English pub staff – to apologize for rushing. They didn’t say much other than “Oh well you seem to be in a hurry” but we know from Fox that they never would have told us if we were being rude. I suspect they may have tut-tutted among themselves after we had left. Well I’ll keep this relatively short for now. I’m sure there will be more observations such as these as our time in London goes on, and as we get used to the customs and habits and begin to become part of them ourselves, I wonder if we’ll start to read Fox in a different way.